This painting’s title is “Enclosed Field with Reaper.” Does the word “reaper” in the title cause a little glitch of discomfort in the back of your mind? 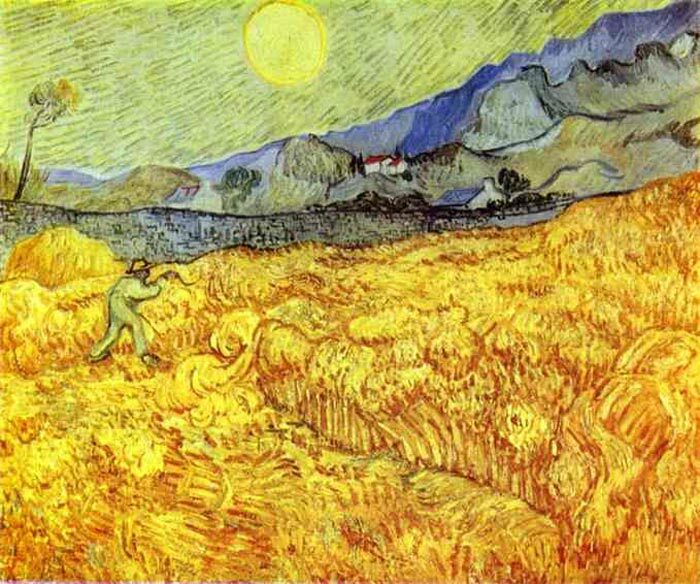 It’s only natural that it might…after all, most people associate the word with the “grim reaper.” But we can comfort ourselves with the notion that in the 1800s the term was simply a common agricultural term, and van Gogh obviously intended to simply portray a farmer at harvest time. Or can we? In a letter to his brother, van Gogh said of this painting, “I see in this reaper … the image of death, in the sense that humanity might be the wheat he is reaping.” So is van Gogh the originator of what we now know as slasher movies? SPECIAL NOTE : The painter will make the reproduction as close to the original oil painting as possible. If you want your painting to alter from this likeness, please email us and " Reaper, 1889 " will be reproduced according to your special requirements.